We’d love your help. Let us know what’s wrong with this preview of The Sacred Enneagram by Christopher L. Heuertz. For all the ways we live unawakened lives, the enneagram is here to help. The Sacred Enneagram is a trustworthy, richly insightful guide to finding yourself in the enneagram’s 9-type profiles, and applying this practical wisdom for a life transformed. Far more than a personality test, author Chris Heuertz writes, the enneagram is a sacred map to the soul. Lies about who we For all the ways we live unawakened lives, the enneagram is here to help. The Sacred Enneagram is a trustworthy, richly insightful guide to finding yourself in the enneagram’s 9-type profiles, and applying this practical wisdom for a life transformed. Far more than a personality test, author Chris Heuertz writes, the enneagram is a sacred map to the soul. Lies about who we think we are keep us trapped in loops of self-defeat. But the enneagram offers a bright path to cutting through the internal clutter and finding our way back to God and to our true identity as God created us. 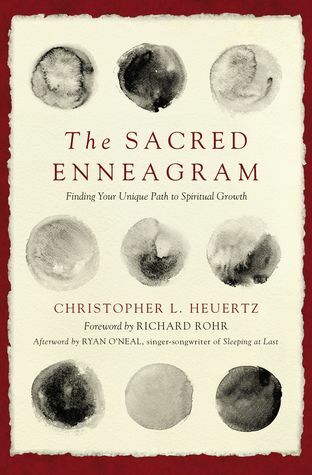 Chris Heuertz’ life was forever changed after he learned about the enneagram 15 years ago. Today, he leads enneagram workshops all over the world. Join Chris as he shows you how this ancient tool can help you awaken to the gifts God has given you, find freedom from your personal patterns of sin and fear, and grow in acceptance of your identity as you grow with God. To ask other readers questions about The Sacred Enneagram, please sign up. I read The Road Back to You and listened to the podcast. I'm a fan of Typology and have read several other books on the Enneagram. As a result, I have a deeper understanding of myself and have gotten better at the dubious art of typing other people. This book connected the dots for me, in terms of spiritual formation. Heuertz discusses the types, intelligence centers and the harmony/dominant affect groups to reveal a unique path into the life of prayer in the contemplative tradition. For example I read The Road Back to You and listened to the podcast. I'm a fan of Typology and have read several other books on the Enneagram. As a result, I have a deeper understanding of myself and have gotten better at the dubious art of typing other people. This book connected the dots for me, in terms of spiritual formation. Heuertz discusses the types, intelligence centers and the harmony/dominant affect groups to reveal a unique path into the life of prayer in the contemplative tradition. For example, Heuertz says that as an Ennegram 7, I am called to rest in silence. Here is how it works: contemplative spirituality advocates silence, solitude, and stillness. These three postures map on the Enneagram's intelligence centers (Mind, Heart and Body). The mind/thinking types (5,6,7) are each called towards silence. My harmony type/dominant affect is that of a frustrated idealist (along with 1s and 4s). These types, are called particularly to a prayer posture of rest. I learned a lot from this book about how the Enneagram works. I had a superficial understanding about types, wings and arrows but Heuertz made sense of some things for me. And he makes some good inferences on how to approach prayer. This is useful personally and also for guiding other people. Jane Thank you for sharing how this book helped you. I've had the book The Road back to You recommended to me. Goodness. What a frustrating read. I am glad that I read this once, but I hope that I never have to read it again. There are some real gems in here, for all types, but it is so poorly written and even worsely (the bad writing is contagious!) organized. I cannot believe that someone edited this book. Reading the acknowledgements, it looks like a lot of people were involved in proofing copy. They should all give their checks back for the days they worked on this book. Ugh. You want specifics? Okay Goodness. What a frustrating read. I am glad that I read this once, but I hope that I never have to read it again. There are some real gems in here, for all types, but it is so poorly written and even worsely (the bad writing is contagious!) organized. I cannot believe that someone edited this book. Reading the acknowledgements, it looks like a lot of people were involved in proofing copy. They should all give their checks back for the days they worked on this book. Ugh. You want specifics? Okay. Any section giving context to the enneagram or the history of the enneagram was basically just pulled quotes from other sources, to the point that he has to use multiple names for the same idea. This is an example of poor organization. Some explanations of the enneagram seemed to be just lifted from other sources. Parroting is not flattering. If you can't integrate the knowledge you have into a coherent and CONCISE story, then maybe don't write a book. I can only assume that earlier versions were worse and this was the best a whole team of editors could do. I don't know. Here's free advice for the second edition. Simplify the history lesson. Introduce the concepts (enneagram specifics, contemplative spiritual theory) you want to discuss and how they work together. Explain in separate chapters how these concepts work for each type and what the practice of contemplative practice looks like for each type. Instead, I'm wading through all of this chaff to find the kernels of truth that will, granted, be edifying. I'm literally taking notes on the disparate gems for my type and condensing to a single page of notes that I can reference, because, again, I will never ever read this book again. I release my resentment about spending time slogging through what could have been so much better and accept this book as it is. Amelia Barnes As a fellow type 1 (and also an English teacher), I appreciate this review. I love the Enneagram but disagreed with most of this book. While I thought his overviews of each type were helpful, I was confused and disturbed by his spiritual advice. I’m discovering that learning about one’s true self through the enneagram is not for the faint of heart and reading “The Sacred Enneagram” is no exception. I loved this book, though. Chalk full of insights, Christopher Heueretz unpacks each type and examines triads. I especially loved how he integrated Henri Nouwen’s work and contemplative spirituality as well. Highly recommended for using the enneagram as a spiritual discipline and a way in which to come to know one’s true self before the One w I’m discovering that learning about one’s true self through the enneagram is not for the faint of heart and reading “The Sacred Enneagram” is no exception. If you are interested in the Enneagram, read The Road Back to You: An Enneagram Journey to Self-Discovery, not this book. I almost dropped this one. Hard to follow; wasn’t clearly laid out. Some of it was helpful, some weirded me out a little. I much preferred The Road Back to You. This book was deep and confusing at times, but I found a chapter on solitude and silence really helpful. I think there are probably more down to earth enneagram books out there that I would be interested in reading! I’ve read the Road Back to You, listened to several podcast episodes on the Enneagram, and attended a 1 and a half hour seminar on the Enneagram from an expert in my christian non-profit organization (that’s actually how I had the “aha moment” for my type after having unwittingly mistyped myself from a test for a year with superficial understanding and impact). This book could be for beginners since it’s pretty comprehensive, but it’s also very in depth which makes it especially helpful for peop I’ve read the Road Back to You, listened to several podcast episodes on the Enneagram, and attended a 1 and a half hour seminar on the Enneagram from an expert in my christian non-profit organization (that’s actually how I had the “aha moment” for my type after having unwittingly mistyped myself from a test for a year with superficial understanding and impact). This book could be for beginners since it’s pretty comprehensive, but it’s also very in depth which makes it especially helpful for people who are pretty familiar with the Enneagram and their type but want to know where to go from here. This is a great next step for actually *how* to grow and find freedom and healing in it. Heuertz accomplishes this in the latter chapters by connecting the dots between the ways we uniquely “get lost” in our types and how to “find our way home” to God and our true selves through particular contemplative prayer practices, with different postures (silence, solitude, or stillness) and intentions (rest, consent, or engagement) based on each of the 9 types. He also describes how Examen, centering prayer, and welcoming prayer (which relates to body tension and emotions) are a means to find our way back home to God and our selves. I listened to it on audiobook which was helpful for getting through it quicker, but I’ll probably pick up a print version and go back through some of the sections to fully wrap my mind around the terminology and concepts. 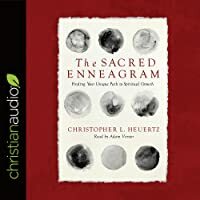 This book perfectly pairs with the EnneaApp has a way to better understand the terminology and the Enneagram in all its nuances, because Heuertz introduces a lot of “insider” language and different definitions for common words like “passion” and “fixation” and “childhood wound” in terms of the Enneagram. Slow read because I read it on my kindle app but for sure my favorite enneagram book. Highly recommend. I will reread. The best book on the Enneagram put there. Instead of pouring over type stereotypes for pages and pages (which only feeds our egotistical tendencies), he illuminates and simplifies how the Enneagram is a tool that helps everyone in a similar way. His chart for how we are all our true self, but somewhere along the way we experienced trauma and developed different ways of coping, was a big light bulb for me. Those coping mechanisms became habitual patterns that most of the time we’re not even aware The best book on the Enneagram put there. Instead of pouring over type stereotypes for pages and pages (which only feeds our egotistical tendencies), he illuminates and simplifies how the Enneagram is a tool that helps everyone in a similar way. His chart for how we are all our true self, but somewhere along the way we experienced trauma and developed different ways of coping, was a big light bulb for me. Those coping mechanisms became habitual patterns that most of the time we’re not even aware of. I love that he says the Enneagram is a collection of nine mirrors that we can find ourselves in, and hold up to see the self-inflicted traps where we function. The most helpful part of this book is when he stops focusing on type and says “Where do we go from here?” He provides a simple and beautiful plan for each type to help balance out and deconstruct the hang ups of our type. After reading this book, I actually had a tangible practice for reconnecting with my true self, breaking down this outer image that I’ve associated with for too long, and have felt true inner peace at long last. The Enneagram is the the midst of quite a moment right now, and I've felt a combination of elated excitement that more and more people are getting on board as well as a bit of overwhelmed apathy in light of the onslaught of new books, podcasts, and so on. For that reason, I slept on this new contribution to the sphere and it took a whole year of hearing different folks not just rave about it, but recognize that it was offering new and unique insights to finally pique my interest. Having spent th The Enneagram is the the midst of quite a moment right now, and I've felt a combination of elated excitement that more and more people are getting on board as well as a bit of overwhelmed apathy in light of the onslaught of new books, podcasts, and so on. For that reason, I slept on this new contribution to the sphere and it took a whole year of hearing different folks not just rave about it, but recognize that it was offering new and unique insights to finally pique my interest. Having spent the past few days pretty engrossed in it, I'm happy to join the choir and share that this is definitely the most dynamic resource I've seen on the Enneagram and one that I'll heartily recommend myself. It's especially exciting for folks like me who are already in pretty deep, as it offers quite a few insights that are either rarely explored or being developed for the first time here. As I mentioned, I've spent what some may consider an embarrassing amount of time diving into the Enneagram, so what I really loved about this book was how unique it was compared to what's already out there. The Harmonic Triads, a centerpiece of the ideas here, were brand new to me, and of course so were the Contemplative Practices that accompanied each cluster since he is introducing them here. Even beyond those, I was impressed by the ways he drew extensively from well-developed insights from within and beyond the Enneagram to provide scaffolding to his own thoughts and was particularly struck by how centrally he engaged with the Intelligence Centers (head, heart, body) which I hadn't really paid too much mind to before. What I most appreciated was Heurtz's clear intention of going beyond the general 101 of each type, and I think he accomplished his goal of presenting a roadmap beyond that introductory stage with unique, thoughtful, and nuanced invitations to deepen and transcend one's knowledge of the system as a tool for self-liberation and spiritual growth/homecoming. While I would mostly agree that it isn't necessarily the ideal starting point for the Enneagram, there are so many other resources aiming to be exactly that and I think there's just as much need now for ones like this that are aiming at next steps and more engaging implementation and integration of the tool. It took me a long time to finish this book because I had to pause between the many revelations to live with it. Highly recommend to...everyone. This book is mad crazy. If you want to worship the Enneagram, this is the book for you. Otherwise, pick something else. Pros: this is a much deeper dive into the theory of Enneagram than some other books such as Road Back to You; focuses more on sin and struggles than other works that I've read or skimmed; I have a much more solid understanding of the Enneagram after reading this book; the appendix on how often people are mistyped was very useful. Cons: the first 80 pages almost put me to sleep. Not too sure why they were included, but I guess the author wanted someone who never encountered Enneagram to have a tho Pros: this is a much deeper dive into the theory of Enneagram than some other books such as Road Back to You; focuses more on sin and struggles than other works that I've read or skimmed; I have a much more solid understanding of the Enneagram after reading this book; the appendix on how often people are mistyped was very useful. Cons: the first 80 pages almost put me to sleep. Not too sure why they were included, but I guess the author wanted someone who never encountered Enneagram to have a thorough introduction. If you skip them, you aren't missing out on much (the introduction bumped it down from four stars to three); I did not find this book as practical as I had hoped. Heuertz provides some example ways to pray, but I was wanting something much more guided in how to apply the lessons learned. He could have given some questions or suggestions to get you thinking. I can not recommend this book enough! Very helpful descriptions not only of what the enneagram is but why it is and how it helps us on our spiritual journey. Many investigations into the Enneagram stop with the type descriptions. But it isn’t enough. We need to allow a space for this tool to transform us. This book really breaks down how each of us can find our way home. If you are at all interested in the Enneagram, you need this book. This book takes a tool for understanding yourself and others and turns it into a cult of religious fanaticism. This might not have been the best book to start my knowledge of the Enneagram with. It talks a lot about them before defining them and it also discusses the literature about them a great deal. I appreciated the idea of finding my own spiritual path using the Enneagram and the back half of the book was really useful. This should have been my second or third book on the Enneagram though, I think. A great next level Enneagram book if you know your type. Interesting and deep. Listened on audio and definitely had to be in the right mood to listen, but it was informative and had lots of background info on the enneagram. This book has a differing structure to most Enneagram books, the chapter's are topic based instead of isolating each number. It is a good place to start with the Enneagram, but not many surprises if you are have already done a lot of Enneagram digging. My first introduction to the Enneagram. Fascinating! I’ve never seen in print something that describes the very core of my being so well. Revelational. It was as a little hard to follow in the beginning as he tried to explain what the Enneagram is and how it came to be. And I’m still not clear on that, but overall great book that could be helpful to anyone. Road Back to You was the first book I read about the Enneagram. I found this to be much more thorough with good ideas for implementation. I found this book to be the most helpful of the Enneagram Reading I have done so far. I often read Enneagram material and find that I see my struggles and issues revealed, but am offered little guidance on how to grow and change. This book offers a very in-depth and well researched look at Enneagram history and modern use. Chris Heuertz desires that you fully understand triads and their role in addition to the usual explanation of each type. I found that in this book there is a focus on not usin I found this book to be the most helpful of the Enneagram Reading I have done so far. I often read Enneagram material and find that I see my struggles and issues revealed, but am offered little guidance on how to grow and change. This book offers a very in-depth and well researched look at Enneagram history and modern use. Chris Heuertz desires that you fully understand triads and their role in addition to the usual explanation of each type. I found that in this book there is a focus on not using stereotypical descriptions,that are flat and simplistic. Instead of that, the descriptions are helpful, real, and distinctive. The final portion of the book focuses on prayer practices as a way of coming home to yourself and to God. These practices are described thoroughly and each type receives a prayer practice suggestion and an intention to pray towards. I am fairly new to the Enneagram and I picked this up hoping for a deeper understanding of how the Enneagram could line up with my faith. While there was plenty of background and context around the foundation of the Enneagram, I was hoping for more practical integration and applications (not just a couple of chapters at the end). I appreciated the charts and explanation of each type. I struggled to connect with the author's voice throughout the book. There was a lot of self-awareness and contempl I am fairly new to the Enneagram and I picked this up hoping for a deeper understanding of how the Enneagram could line up with my faith. While there was plenty of background and context around the foundation of the Enneagram, I was hoping for more practical integration and applications (not just a couple of chapters at the end). I appreciated the charts and explanation of each type.